Welcome to Colorado Security Products, Inc. Established in 1977, Colorado Security Products, Inc. is one of Colorado’s oldest and most experienced security companies. As a locally owned and operated Colorado company, we have earned the trust and confidence of the community; trust that can only be gained through decades of reliable service. 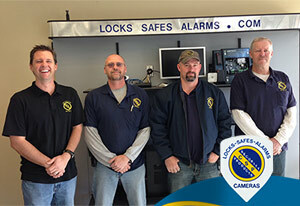 We are known for being a reliable auto locksmith as well as being the best source for safes in the Denver metro area. Our dedication to customer service and customized approach to security give us an edge over the competition. Whether your security needs are as elaborate as a multi-camera and access control system, or as simple as re-keying a deadbolt, our specialized staff are trained to meet them. Browse through our site to see the diversity of security products and services we offer. We have the best solution for every security need, and our great line of products comes from the finest manufacturers. Ask us about the latest, progressive security technologies available – we’re happy to help you find the best security products for your home or business. Your safety is of the utmost importance to us! Colorado Security Products, Inc is your one-stop-shop for professional, custom-tailored, and effective integrated security products! So give us a call today for emergency service – 24 hours per day, seven days per week; or schedule an appointment for a security consultation. Our technicians are always available and will meet your needs in a prompt, courteous, and professional manner. The typical home invasion happens in seconds! Don’t let this happen to you. Contact us today for a complete, comprehensive security evaluation.